Asylum Cigar Company was launched in 2012 by Christian Eiroa and Tom Lazuka after both had spent years building Camacho Cigars before selling the company to Davidoff. 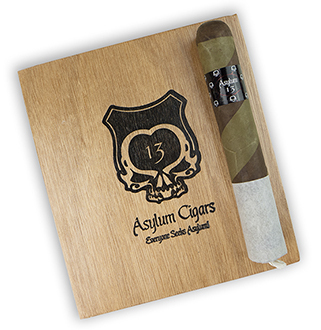 With premium tobacco leaf grown on Christian's family farms and produced by Tabacaleras Unidas, the handmade Asylum 13 cigars are true Nicaraguan puros. The gorgeous dark Habana wrapper holds a combination of aged Cuban seed long filler and binder grown in the black volcanic soils of Nicaragua. Expect a slow, cool burn from this medium- to full-bodied complex cigar that serves up notes of earthiness, espresso, cocoa, and sweet, gentle spices. 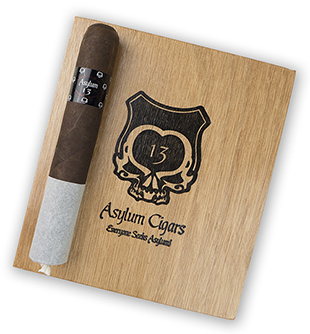 Asylum 13 Ogre cigars are expertly wrapped in dark Habano and Candela leaves to create a barber pole effect and, considering their girth, these mild to medium-strength, full-bodied Nicaraguan puros are cool burning with an excellent draw. They're also monstrously tasty with notes of creamy chocolate, espresso, pepper, light spice, grassiness and leather, and these are just the flavors that are front and center. The Ogre will surprise you with its complexity.